Running isn’t all about strong legs. 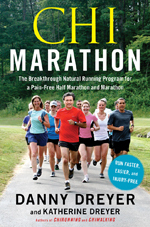 In fact, it isn’t about that at all, says Danny Dreyer, running coach, ultramarathoner, and co-author of Chi Marathon. Here’s how he uses principles from tai chi to run faster and injury-free. How did the whole ChiRunning idea first come about? Danny Dreyer: It stemmed from a combination of two things. 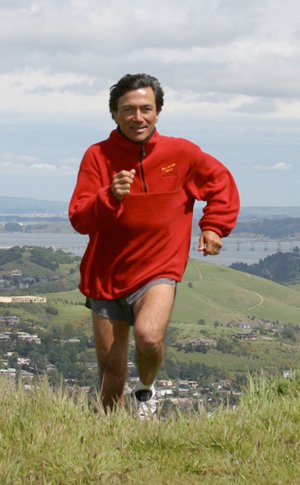 I started doing ultra-marathons in 1991 and didn’t retire until 2005. So I spent a lot of years running long distances, up to 100 miles. I was always studying how to get more efficient. It was an internal practice for me. I was really into meditation and stuff like that, and I just thought, “How long could I run if I were just calm and relaxed out there?” It was good chance to learn about myself. It wasn’t until 1998 that I was introduced to tai chi. When I took my first tai chi class, the instructor was talking about how you always only move from your center, because that’s where your energy comes from. Your strongest muscles are there. All of a sudden, it was like things totally broke loose—I saw how much easier my running could be. What is wrong with the way most people approach training for a marathon? Most people run by powering with their legs and pushing with their feet. It means they have to propel themselves forward with the smallest muscles of the body. They’re relying too much on those small muscles, as opposed to the much stronger muscles of the core—and that’s why the predominance of injuries are from the knees down. There’s no question that’s why it causes so many problems. So how do you change from using those small leg muscles to using their core? ChiRunning is based on posture. If you’re posture is really good, your core muscles will automatically be engaged. It involves a forward lean that starts down at your ankles. If you lean at your hips, you still have to push yourself forward with your feet. From there, you allow yourself to fall forward—it’s a controlled fall, which makes running easier because you’re gravity-assisted. As you fall forward, your legs don’t have to be a propulsive force. The only work your legs have to do is support your body and to keep up with your fall; it just requires picking up your feet. You become not only more efficient, but you’re also not overusing those small muscles. It also reduces your impact. The successful tai chi artist doesn’t resist a punch, he cooperates with the force and moves in the same direction. In ChiRunning, there are two forces: the pull of gravity, which you cooperate with by leaning into it; and the road coming at you. The last thing you want to do is stick your foot into that oncoming force. If you can land with your knee back and your foot underneath you, the road sweeps your leg behind and helps move you forward. What’s the hardest part of teaching people to change the way they run? The biggest difference in technique and the biggest challenge I have in coaching people is just getting them to pick up their feet instead of using them to push themselves forward. You have to kind of start from scratch and feel what your legs want to do—which is just to keep up with your fall. I’m trying to hit the reset button: Kids all run with a lean, they just intuitively do it that way. It’s getting people back into that natural, original form of running. How long does it generally take people to learn how to do it correctly? The vast majority people will get it in one day. For most people, if they practice the focuses [detailed in the book], their posture, how to hold their arms, etc., and if they have a reasonably good connection with their body, they can get to a point where it feels very natural within a month. You have a training plan in the book; what’s it like? It’s really designed so someone can start from scratch and be able to work up to a half marathon within four months. It’s a very holistic approach, broken it down into phases. The first phase is getting your brain around it: Why am I doing this? It’s important to start with a vision. The next phase is dedicated to working on your technique. You can’t do a marathon on training alone; it has to be based on really good movement patterns. No other training programs have this focus on technique. So then you move into the conditioning phase, where you build up mileage. And the next phase is mastery—in which you find the specifics of that course, like hills and flat sections, and mimic them in your training. So you’ll go into race day knowing exactly what to expect. You talk a lot about aiming to take 170 to 180 steps per minute? Why is that important? It’s the most efficient cadence. If your cadence drops below 170, it generally means you’re spending too much time on the ground and are burning too much energy just supporting your body weight. And if your cadence is too high, it usually means you’re using your leg muscles too much to propel yourself. So even though the legs should just be supporting you, not powering your run, is it still important to do some weight-training exercises to strengthen your leg muscles? No, not necessary. The only time it’s necessary is if you know you have a weakness, like weak ankles; then you need to strengthen the area. But you don’t need stronger leg muscles to run faster. I do, however, encourage people to stretch after their runs—that will help you gain a little range of motion. Do you think weight-training could be detrimental to running? Sometimes it can shorten your muscles and reduce your range of motion. Weight lifters don’t have any range of motion. For running long distances, you need to have more relaxed, sinewy muscle. Strengthening your core must be a big focus with ChiRunning, though. Any moves you recommend? Planks, bridges, and I love light crunches—rather than doing sit-ups, you just pull up the upper body and hold it; this is great because it’s an isometic exercise and leaning forward is isometric as well. You could also just stand next a couch, rest your quads against the highest point, then lean forward and hold it. You say that a speed interval “is not about trying to run faster. It’s about creating the conditions for speed to happen.” Will you explain what you mean by that? There’s a number of things when you do a speed workout, you’re not doing it necessarily with the goal of getting faster but the goal of increasing my range of motion, by teaching your legs to kick back farther. You don’t want to reach forward with your legs; that’s overstriding. That’s a danger. The feet should land as close to under your center mass as possible. You want to relax your hips so your legs can swing farther while working on your balance, so you can lean forward more. Check out Chirunning.com for more info and training plans.